Presenting a feature on Omkarnath Thakur - musician extraordinaire and a model for every self-respecting Bharatiya. Pilfered from: "Great Masters of Hindustani Music" by Smt. Susheela Misra, Hem Publishers Pvt. Ltd., 1981. After listening to Pandit Omkarnath Thakur's music once, Mahatma Gandhi is said to have remarked : "Pandit Omkarnathji can achieve through a single song of his, what I cannot achieve through several speeches." Such was the impact of Omkarnath Thakur's personality and his music on listeners. Besides being a successful musician, he was also endowed with an impressive personality who combined in himself many wonderful qualities of head and heart. The story of his early boyhood years is really a moving one, filled as it was, with struggles, privations, and poverty. But instead of being crushed under all this suffering, the boy's strong character, his inborn talents, and his fine qualities emerged with a rare brilliance out of the purifying fires of suffering. Omkarnathji's life-story proves how one who is destined to achieve greatness in life, will emerge triumphant, however adverse the circumstances might be. Such real-life stories strengthen one's belief in the Hindu theory of Samskara the accumulated knowledge, goodness, culture etc. that one has earned through previous births. Omkarnath was born on 24th June 1897 in village Jahaaj, in District Bhadaran (Cambay now). He was the fourth child of his parents. He had two brothers and one sister, named respectively Balakrishna (aged 12), Ravi Shankar (aged 4), and Parvati (aged 8). His paternal grandfather Pandit Mahashankar Thakur, and father Pandit Gauri Shankar Thakur had been brave warriors in the services of Nana Saheb Peshwa and Maharani Jamnabai respectively. But, contact with a Yogi named "Alonibaba" changed the entire life and outlook of Pandit Gauri Shankar. He began to lose interest in all worldly affairs, and was initiated into Pranav-Sadhana or meditation of Pranava or "AUM" to which he began to devote more and more of his time. As his fourth child was born during this period of his life, he named the boy "Omkarnath". Although Gauri Shankar led the life of a householder, his mind was pre- occupied most of the time with meditation on Pranava. Living in her husband's large joint-family, Omkarnath's mother Jhaverba had to put up with neglect, ill-treatment and harshness from her hard-hearted brother-in-law (Gauri Shankar's elder brother) who finally misappropriated all her clothes and ornaments, and turned out Jhaverba and her 4 small children from the house. But she was an amazing woman, full of an innate dignity, self- reliance, and endowed with immense reserves of physical and mental strength. Married to a recluse of a husband, and left with no other source of help, Jhaverba brought up her children independently by taking up domestic work in various houses. She never lost courage, nor sought help from anyone. The strong character, robust constitution, and innate sense of self respect of his mother were to leave a lasting impression on the young Omkarnath's mind and character. Few musicians paid such meticulous attention to one's own health as he did. Apart from leading a thoroughly disciplined life, and always remaining very frugal in his eating habits, he devoted considerable time daily to physical exercises, "Surya-Namaskaaram", swimming, and even the exercises he had learnt from the famed wrestler Gaama ! Even in his late fifties, he is said to have continued most of these exercises. From his father, Omkarnath inherited great courage and a religious bent of mind, an urge for Pranav-Saadhana which, in his case, went a step further, into Naada-Upaasana, or worship of the Infinite through Music. When his father took to "Sanyas" and went to live alone in a little hut on the banks of the River Narbada, young Omkarnath was torn between his love and concern for his poor, over-worked mother, and his adoration for his religious-minded father. The boy learnt cooking and began to work as a cook in a lawyer's house in order to supplement his mother's meagre earnings as a domestic servant. In between he would run many miles so that he could reach his father's hut, clean, sweep and cook for him and fill pitchers of water for his use ! He imbibed the courage and dignity of his mother, and the scholarly austere nature of his father. For some time, he worked as a mill-hand. The owner of the mill was so captivated by the curly-haired, good-looking, intelligent and hardworking boy that he wished to adopt him ! But Omkarnath's father adamantly refused:-" My boy will not become the adopted son of some rich man. But he is going to win rich laurels and fame with the blessings of Goddess Saraswati". Omkarnath used to say that his father was gifted with many miraculous Yogic powers. He had foretold the exact day and hour of his death (in 1910. Prior to shaking off his mortal coils, Pandit Gauri Shankar called his favourite son Omkarnath to his side blessed him with a betel-roll with which he wrote a precious "mantra" on the boy's tongue ! Before long, Omkarnath's deep love and yearning for music and his rare musical talents became obvious. His saviour came in the form of Seth Shahpur-ji Mancherji Dungaji, a very generous philanthropist from Bhadoch. The kind Sethji got Omkarnath admitted into Pandit Vishnu Digambar's Music School in Bombay. 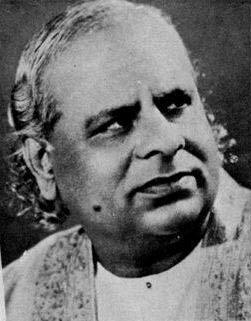 Under Pandit Digambar's loving guidance and training, Omkarnath was groomed into an excellent musician. During those rewarding 6 years or so in the ennobling presence of his guru in the latter's gurukula, Omkarnath served his teacher like a devoted son, and imbibed all the music that he had longed to learn. The guru was so pleased with his progress that in 1916 when the former started his famous Gandharva Maha-Vidyalaya in Lahore, he appointed the 20 years-old Omkarnath as the principal ! While serving the school in this capacity, young Omkarnath led a very disciplined and pure life, setting aside only 6 hours for sleep, and devoting the remaining 18 hours for his own riyaz and for teaching his students. In 1918 he was sent to Baroda as an Examiner where he left a deep impression on Maharaja Sayajirao Gaekwad and on the Diwan Sri Monubhai. In the same year, he was invited to sing in the famous Harvallabh-mela of Jullunder on the same day as Pandit Bhaskarbuwa Bakhle. It is said that both of them-the young and handsome Omkarnath, and the ageing veteran Bhaskarbuwa Bakhle gave such fine recitals that the audiences showered coins and ornaments on the stage as a mark of appreciation ! That was the beginning of his spectacularly successful and long career as a performing musician, a career which was to last until his last fatal illness several decades later. Even after he reached the peak of his career, he never relaxed in his Naadopaasana. Along with this, he carried on his Yoga-Saadhana, physical exercises, and worship of his favourite deity, Sri Rama. For 25 continuous years (1926 to 1951), he kept up his daily recital of Cantos from the Ramcharitamaanas, of which he had made a deep study. Like his Guru Pandit Vishnu Digambar, Omkarnath also specially enjoyed the Ramdhun and Ram-nam-Keertan. In 1922, Omkarnathji married Indira Devi the noble daughter of a rich Seth, Prahladji Dalsukhram Bhatt of Surat. In 1924 he got his first chance to go to Nepal on a royal invitation. In spite of the hardships of the journey to Nepal in those days, it turned out to be a worthwhile trip because Omkarnath won the unstinted admiration of H. H. Maharaja Chandra Shamsher Jang Bahadur who rewarded him with Rs 5000 in cash and offered him the post of a court musician on a monthly salary of Rs 3000. But Omkarnath refused this tempting offer because he was longing to get back to his mother at whose feet he, on his return, placed all the money and costly presents that he had received as rewards. This was something he had always longed to do. Practice of music and study of ancient Shastras became his obsessions. He was also a great patriot, and was elected as President of the Bhadoch Congress Committee, and as a member of the Gujarat Provincial Congress Committee. In 1930 Omkarnathji was again invited to visit Nepal and was showered with more honours and rewards. This time he placed everything at the feet of his revered Guru Pandit Vishnu Digambar who embraced his worthy pupil with great love and pride. From then onwards, his fame spread far and wide, and he was invited to sing in Music Conferences in Mysore, Hyderabad, Bengal etc. In Hyderabad he gave such an inspired rendering of raga Malkauns that Pandit Digambar hugged and blessed him with tears of pride and joy in his eyes. Earlier in his life, while working as an employee in a Jain establishment, Omkarnath had learnt to read and write from the Jain monks. Later on, by his own efforts he had mastered several languages like Hindi, Marathi, English, Sanskrit, Bengali, Punjabi, Urdu and Nepali. Really, his thirst for knowledge was unquenchable. After the death of his beloved Guru Pt. Vishnu Digambar in 1931, Omkarnath went to Italy on an invitation to participate in the International Music Conference in Florence (1933). The story of how "he sang before Mussolini and cured him of his insomnia" was soon on everybody's lips. Thereafter, be travelled widely, giving music recitals, lecture demonstrations in Germany, Holland, Belgium, France, London, Wales, Switzerland etc. He sang before King Amanullah of Afghanistan. In London, some friends advised him to beg for an opportunity to sing before King George V, so that he could obtain the title of "Rai Bahadur". But Omkarnath was too self respecting to stoop to such means for obtaining free titles. He was proceeding to Russia when he suddenly received the shocking news of the sudden death (in childbirth) of his gentle, devoted wife, Indira Devi. He rushed back home and was so stunned by the loss that he had a breakdown and a temporary loss of memory. Omkarnath always spoke tenderly of his loving life-partner but for whose selfless devotion and co-operation, he could never have attained the status he did in music. I still remember how at a huge music conference in Calcutta many years ago, the audience requested him to sing Neelambari. But he begged to be excused as Neelambari had been a favourite of his late wife and he felt he would have a breakdown if he tried to render it that evening! He always cherished memories of her devotion gratefully. After her death, his relatives, friends, and even his loving mother tried hard to persuade him to remarry, but Omkarnath stuck to his Eka-Patni vrata saying: "My favourite deity is Lord Rama. Like Him, I believe that each man should marry only once in his life-time, and cherish her throughout life." Artistes are generally associated with moral laxities and even vices. In such a world, Pandit Omkarnath's life stands out as a rare example of lofty morality, self-discipline and austere living. After Pandit Omkarnath recovered from the shock of his wife's tragic death and resumed his singing career, his music was tinged with a touch of pathos. He left Bhadoch with its painful memories, and migrated to Bombay where he started his "Sangeet Niketan". Meanwhile, he travelled all over the country giving recitals, and won wide popularity. Mahaamand. Madan Mohan Malaviya was very keen to start the Faculty of Music in the Benares Hindu University under Panditji s guidance, but Malaviyaji died before this was finalised. However, Pandit Govind Malaviya fulfilled his father's dream in August 1950 when the Music Faculty was inaugurated in B.H.U. and Pandit Omkarnath was appointed its first Dean. He occupied the Chair with great dignity, worked with a missionary's zeal, and nursed the infant Faculty into blooming youth. Not only did he possess a magnetic personality, high musical calibre both as a singer and as a musicologist, but also he had the compassion of an artiste, administrative acumen and gifts of oratory, infinite patience as a teacher, and deep love for his disciples. Cut off from his kith and kin, he began to look upon his shishyas as his true sons and daughters. He has left a large legacy of good disciples, many of them being practical musicians, while some others became well-known musicologists. Among them, a few names are:- Dr. Premlata Sharma, Yashwant Rai Purohit, Balwant Rai Bhatt, Kanakrai Trivedi, Shiv Kumar Shukla, Phiroj K. Dastur, Bijonbala Ghosh Dastidar, Dr. N. Rajam, Rajbhau Sontakke, Smt. Subhadra Kulshreshta, Atul Desai, P.N Barwe, Kum. Nalini Gajendragadkar, and so on. Few maestros have groomed such a large number of Shishyas in recent times. Dr. N. Rajam, favourite disciple of his used to be his violin-accompanist in nearly all his concerts during the last years of his life. Her style is full of nostalgic touches from her guru's music; often when she tried to recapture their guru's typical touches, Kaakuprayog etc. tears flow from her eyes. That he could inspire so much guru-bhakti in his pupils, proves his goodness as a teacher. "One was struck as much by the leonine grandeur of his personality as by his stentorian voice-- Dressed in a flowing white silk robe, he made a great impression on the audiences by his very presence. His compelling resilient voice with an amazingly wide tonal range, seemed to blend perfectly with the dignity of his bearing". One fact that gave Omkarnathji immense satisfaction and joy was that he realized his long cherished dream of making his beloved mother's last years most comfortable and relaxed. She lived up to the ripe old age of 97 enjoying good health and sharing her devoted son's days of glory, fame, and prosperity. With his beautifully cultivated and powerful voice, his emotional (and dramatic) singing and fluent lecture-demonstrations, he contributed a great deal to the realization of his Guru's ambition of popularising traditional music. About him, Dr. Rajam writes : "The most striking feature of my guru's music was the evoking of emotions in the minds of listeners through the media of swara, sahitya, appropriate facial expressions, Kaakus (voice modulations) etc. His tender and deep emotion found an ideal vehicle in his soft and sonorous voice. The pains and privations that he suffered in life resulted in a unique emotion-packed music. In fact, his tremendous success w ith listeners lay in his deep understanding of the basic emotions and the clear conception of the swaras, the exact tonal shade and the modulations required to translate them into the language of music----Music to him was worship. His approach to Naadopasana was that of a devotee towards religious rituals". In an article entitled "Abhinaya Aur Sangeet", Dr. Premlata Sharma (a favourite disciple of his) points out how a bit of histrionics is essential to make one's music effective. Most musicians do not pay adequate attention to this, and consequently, fail to create any impression on listeners. Pdt Omkarnath made conscious and full use of "Abhinaya" in all its aspects, through dramatic voice-modulations (Kaaku prayog), angaraga (tasteful elegant clothes), mukhamudras (facial expressions) and hastachalan (hand gestures). It was the deliberate use of all these aspects of Abhinaya that helped him to create such a strong audio-visual impact on his audiences. Those of us who have watched and heard him singing some of his special songs like "Jogi Mat Ja Mat Ja", "Mai nahi makhan khaayo", "Ek ban Jogi", "Vandemataram", etc, can always recall and visualize his facial expressions, hand-gestures, and voice modulations for emotional expression. This was how he used to bring out the joys of Bahar, the resigned sadness of Nilambari, the plaintive appeal of "Jogi mat ja" in Bhairavi, or the patriotic fervour of "Vande Mataram"! Prithviraj Kapoor, the famed Thespian, a great admirer of Omkarnath's music used to say: "Omkarnath Thakur's dramatic presentation of songs should not only be heard, but seen too!". On his Alapchari was the deep influence of the style of Auliya Rahmat Khan (son of Hassu Khan). He had fully imbibed the musical style of his guru Pt. Vishnu Digamber. Although. the guru never encouraged Thumri singing, Omkarnath could render Thumris also very effectively. A great scholar in music, Omnkrnath has left behind for posterity many valuable treatises on music such as the "Sangeetanjali" series, the "Pranav Bharati" which covers 3 aspects of music (Swara, Raga, and Rasa). He was also a composer of merit, a vagyeyakar who had good mastery over Sahitya and Sangeet alike. The definition of a vagyeyakar says: "Vaacham geyyam cha kurute, sa Vagyeyakara". Into his compositions he usually wove in at the end his pen-name "Pranav" or "Pranav Rang". He always planned his concert details with a careful eye on audience-reactions. His "Sangeetanjali" deals with the practical aspects of music (6 parts), and "Pranav Bharati" with the theoretical aspects. Among the several awards and titles conferred on him were the "Padma Sri" in 1955, Sangeet Prabhakar by Pdt Madan Mohan Malaviya, "Sangeet Martand" from Calcutta Sanskrit Mahavidyalaya in 1940, and "Sangeet Mahamahodaya from the ruler of Nepal in 1930. Omkarnathji devoted himself heart and soul in building up the Sri Kala Sangeet Bharati in B.H.U. from the year of its inception in 1950 until his retirement in 1957. In 1954 he had a heart attack from which he recovered well enough to resume his concert programmes. The last time I heard him was in our Lucknow Radio Concert on lOth March 1965 (accompanied on the violin by Rajam). In July 1965 he had a serious paralytic stroke in Bombay; when he recovered from this to some extent, he went to his native Broach where he had purchased a house of his liking, but he was not destined to live a relaxed life in that home. For, the severe stroke that he bad in June 1966 affected his whole body, and even his memory. The last years of his life were very pathetic and lonely as his mother, brothers, sister, wife, had all predeceased him. Dr. Rajam wrote: "It was a pity that he had to lead a lonely life all through. He had neither a house of his own, nor a relative to fall back upon in his old age, nor even a reliable servant to look after him. It was a pathetic sight to see him at the ripe age of 65 sweep the floors and cook his food all by himself. He used to remark that it was not in his luck to have a settled home. At the fag end of his career, when he did buy a house at Broach, the cruel hand of Fate prevented him from settling down there." The last stroke of paralysis kept him in painful obscurity for three long years until death, the Healer, came to his rescue. Since he had left Kashi and spent his last bed-ridden years in Broach, very few of his loved disciples could serve or nurse him. Balvantrai Bhatt was one of the few disciples who accompanied him in his funeral procession. Pt. Omkarnath Thakur lived a clean, purposeful and fruitful life and greatly enriched Hindustani music. Large numbers of his shishyas continue his musical traditions and nurse nostalgic memories of their great Guru who left this world on 29th December 1967. Besides his gramophone records, the Archives of AIR have preserved many recordings of Pdt Omkarnath Thakur.